WASHINGTON—U.S. regulators are planning to make “material changes” to the Volcker rule that could save Wall Street billions of dollars. The changes would reduce the compliance burden and give banks more flexibility in their trading activities. The Volcker rule is a provision in the Dodd-Frank Act, a massive compilation of banking regulations enacted in 2010 by the Obama administration. The provision prohibits banks from engaging in risky market bets with their own accounts and limits their relationships with hedge funds and other private funds. 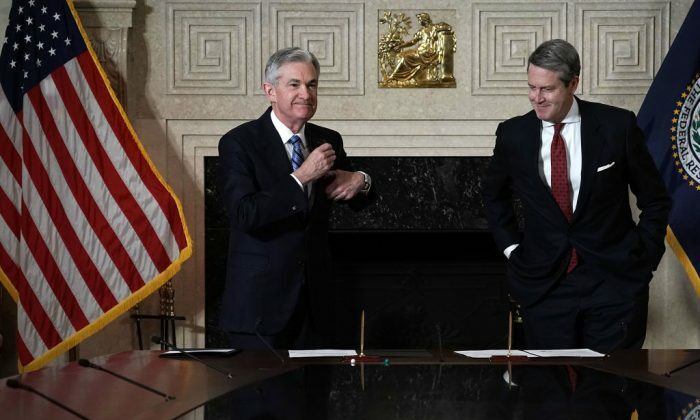 The Federal Reserve is working with other agencies to develop a proposal “that would make material changes” to the rule, according to Fed Vice Chairman for Supervision Randal Quarles. “The Volcker Rule is an example of a complex regulation that is not working well,” Quarles said on March 5 at the Institute of International Bankers conference. For example, “defining market making-related activities rests on a number of complex requirements that are difficult or impossible to verify objectively in real time,” he said. Regulators are also looking for ways to ease the rules on foreign banks operating in the United States. “We want banks to be able to engage in market making and provide liquidity to financial markets with less fasting and prayer about their compliance with the Volcker rule,” Quarles said. The expected changes may also simplify the financial regulatory structure and appoint a lead regulator to oversee the rule’s enforcement. At the moment five regulators—the Fed, Federal Deposit Insurance Corporation (FDIC), Office of the Comptroller of the Currency, Securities and Exchange Commission, and Commodity Futures Trading Commission—have joint responsibility for enforcing the rule. The Volcker rule, which runs more than 1,000 pages, is a significant burden for the financial industry and has indeed failed to eliminate banks’ risky transactions, according to critics. “Volcker rule really didn’t do much to improve the safety or soundness of the banking system,” said James Angel, associate professor of finance at Georgetown University. According to Angel, the main problem is the regulatory edifice. “If we get the regulatory structure right, then the regulators will make the right decisions,” he said. Dodd-Frank is criticized for adding layers of complexity to the spaghetti-like financial regulatory structure of the United States. There are many regulatory agencies with overlapping authority and mandates. “We really need to go back to square one and rethink the structure from the ground up,” Angel said. The Volcker rule is a burden for community banks as well. Congress is working on a bill that would exempt small banks with assets under $10 billion from the Volcker rule, according to a Reuters report. However, exempting them from this burden is not the only regulatory relief small banks need. “The Volcker Rule neither favors nor disfavors community banks. It prohibits all FDIC-insured banks and their affiliates from investing in hedge funds,” Thomas Hoenig, vice chairman of the FDIC stated in an article in American Banker. While many community banks have raised concerns about regulatory burdens, the Volcker Rule is not one they highlight, he wrote. Community banks play a critical role in the U.S. economy by offering a large amount of consumer, residential mortgage, and small business loans. Over-regulation, following the 2008 financial crisis, has made it harder for community banks to operate, and the number of small banks has dropped as a result of consolidation or bank failures. Small banks lost their ability to compete with the larger banks due to increased regulatory demands and capital requirements, making it harder for them to serve their communities profitably.